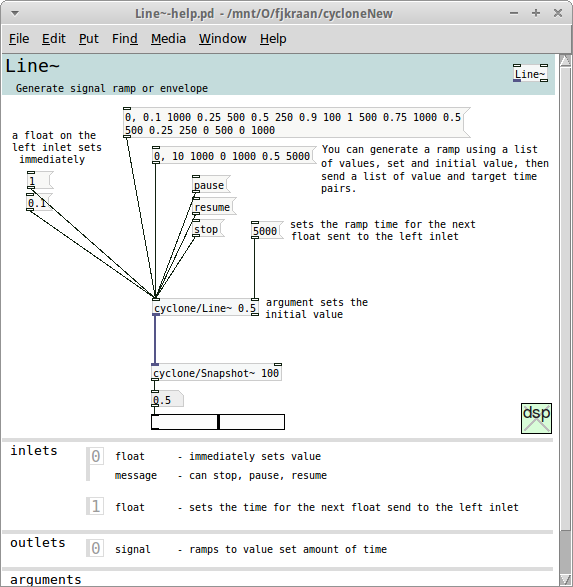 The Cyclone suite of objects is developed to complement Pure Data with objects from Max/MSP. The objects are developed using the Max/MSP documentation and compared with the originals in their Max/MSP environment. The main author is Krzysztof Czaja. 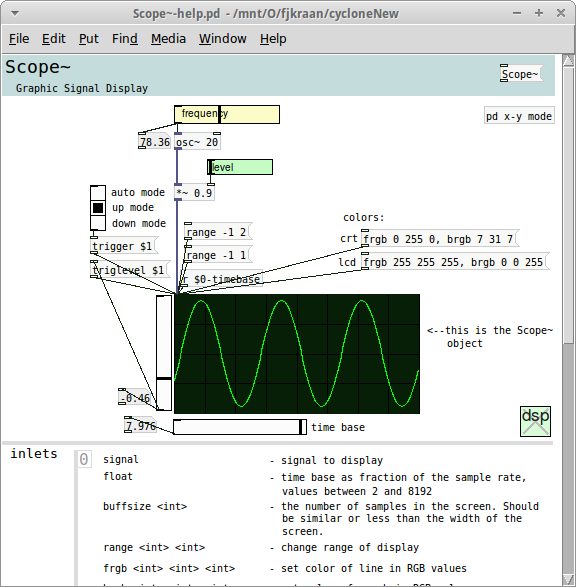 The objects are based on Max/MSP version 4.6. The suite two main parts are hammer and sickle. Hammer are the message-only objects and sickle the signal objects. The names refer to their properties (bang ~ hammer, signal ~ sickle) but also communist symbols. The main author comes from Poland. Cyclone is an contraption of Cycling'74, the company maintaining Max/MSP, and of course, clone. There are 78 objects in hammer, and 77 in sickle. There is no regular maintenance as pd-extended is currently mainly dormant. Most objects work in most mainstream platforms, but some issues remain. Some new issues surfaced in 64-bit architectures and ARM based platforms. It is this and the quality of the help patches that are point of concern. keep the current functionality working on as much platforms as possible. The maintenance project is passed a first phase. Most known code issues are resolved and submitted into the SVN repositry patch tracker. The help-patches are updated and enhanced, based on the cyclone help patches in pd-l2ork which have a format similar to that of pd-core objects in pd-extended. This format is designed by Jonathan Wilkes. The known issues are in the task list, fixed issues are commited to the sourceforge repository. Binary distributions are available from the dist page and via puredata.info/Members/fjkraan/. The deken-plugin can be used to retrieve and install these and other externals. Note the "cyclone-0.1_alpha57(Linux-armv6l-32)-externals.zip" is for the Raspberry Pi Model B. All other Arm boards like the Raspberry Pi 2 Model B, Udoo Boards or BeagleBoards use the armv7l processor and should use the "cyclone-0.1_alpha57(Linux-armv7l-32)-externals.zip". Cyclone page of the original author, Krzysztof Czaja which is no longer available, see the local copy.